After more info for your Fiddle Leaf Fig? Check out my other FLF posts here. Need advice on Fiddle Leaf Fig Pruning? Those waif-like trunks with leafy foliage are quite eye-catching! You can splash out on buying a full-grown plant but this can be expensive – and risky – if you haven’t looked after one before! A much better option is to buy a cheaper and smaller Fiddle Leaf Fig, and enjoy the process of caring and training the plant yourself. 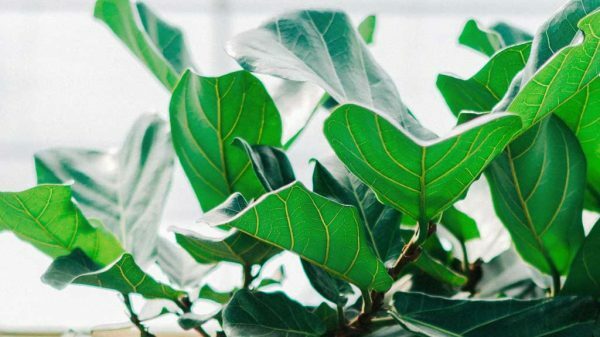 Here’s a guide to growing and pruning your Fiddle Leaf Fig, from bambino to adult size! There’s no question that the Ficus Lyrata aka Fiddle Leaf Figs are the new ‘it’ plant for indoors and generally they are quite easy to look after! I have recently purchased a baby Fiddle Leaf Fig myself and have scoured the interweb for the best info on how to grow and train the FLF into the shape you want. I have heard it said that there are in fact two types of Fiddle Leaf Fig, the bushy type which you can often buy in a cluster of trunks and the more standard / tree form, but keep in mind they are the same plant, so you can generally prune and manipulate it to look how you would like it to look. The standard tree form is more popular, but if you have a bushy type, with time and a bit of work you may be able to train it to look like the decor tree of your dreams! Read on for the guide. The main factors in your Fiddle Leaf Fig’s growth are light, soil and water. Light: If its indoors, your plant will do best in front of a window where it can get loads of light. Start with bright, indirect light but you can always acclimatise your FLF to direct sunlight, which will help it thrive. They also don’t like droughts of cold air. Soil: Well-draining soil is best so as to not keep the roots damp. This will help prevent root rot. Watering: Watering may vary depend on the conditions your Fiddle Leaf Fig is in, but generally start by watering once a week to 10 days. Water fully until the excess drains out the bottom of the pot. You can let the soil mostly dry out between watering. Check the soil is mostly dry a couple of inches deep before watering again, or use a quality moisture meter for reference. If the leaves get dark brown spots from the inside of the leaf, it may be getting too much water or not enough light. If the leaves turn crispy brown from the outer edge, it may not be getting enough water or the air is too dry. Sunburn or leaf-scorch looks like white-yellow to brown spots in areas where direct sunlight touches it. Change something in your fig’s lifestyle and give it time to react: move it’s position, change water levels etc. Growth: During Spring and Summer is when your FLF will appear to grow the most and be getting lots of energy from extra sunlight hours. During autumn and winter it may appear dormant – the fig is conserving its energy to make it through the winter months and may not grow too much. When I started to use a fertilizer on my FLF, I saw the most amazing growth – the leaf size doubled and it grew the most it has ever grown in one season. FLF’s will benefit most from a fertilizer with a NPK ratio as close to a 3:1:2 as possible, or go for this fertilizer which has the perfect ratio of nutrients for FLFs. See this post for more specific info on what fertilizer is best and how to use them. Change: Generally FLFs don’t like change, so if you are planning on doing something drastic (like pruning, splitting a cluster or re-potting) do it at the beginning of a new season of growth, aka Spring so it has enough energy reserved to push through the added stress. When your Fiddle Leaf Fig is looking too big for the pot it may be time to pot-up (aka move it to a larger pot). This will give it more room to grow and get taller. 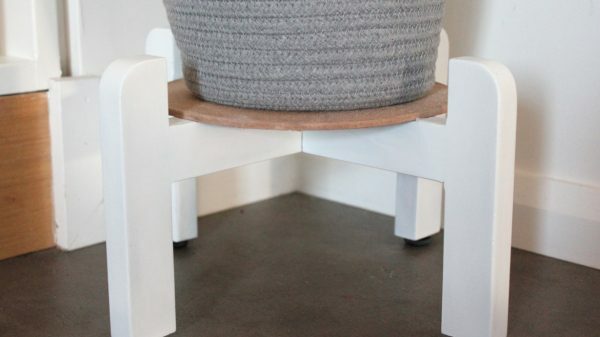 It is also a good idea to fully re-pot your FLF (which means removing as much soil from the roots as you can, trimming and planting it in new soil), which will give it fresh nutrients to grow with rather than reusing the same old soil. While its tempting to get out the secateurs and start clipping your FLF to instantly look like a standard form, this may not be the best way to go about it. Those drool-worthy interior design pics make it so tempting! While your FLF may not be the ideal shape at the moment, if you allow some planning and time to go into it you will end up with a much nicer tree! The process might take at least a couple of years or seasons of growth to get it to the tree you want, but this is OK. Be patient and enjoy the process of training you fig. Firstly, don’t remove the lower leaves! These help bring nutrients to the lower trunk and therefore strengthen and thicken it. FLFs are known for having waif-like trunks, but if the trunk is too thin it won’t be able to hold up the leafy tree-top part like you want and will forever need to be staked or be leaning. In my opinion, removing the lower leaves is probably the last step to do. Separating a Cluster: If you have a cluster or group of FLFs in one pot, its possible to separate them to be single trees. At the start of the growing season, remove them from their pot and carefully separate the roots, giving each plant an appropriate root ball for its size (If you have to cut the roots apart, make sure each plant has a root ball respective to the plant’s size). Replant each one in its own pot. Be aware that some clusters share a root ball and it may not be possible to separate. If your FLF has a cluster of stems that are very close together at soil level, this might be the case. This forum is lengthy but has some great info on one of the key elements in your fig’s growth – the soil! Branching: If your Fiddle Leaf Fig is one trunk with no branches, there are also ways you can help it sprout new branches. One way is to nip off the tip / top few leaves of the trunk to encourage new growth. Another process is called notching, where you make a small cut into the trunk just above a bud you want to branch. This will trick the tree into branching out at this point. If there are branches you don’t want on your FLF, just remove them close to the trunk. You can also use them for propagating and growing a new FLF! For more specific information on growing a FLF tree, this post will be helpful. Are you embarking on a journey with a new FLF? Let me know how its going in the comments below, I’d love to hear about it! Check out my other Fiddle Leaf Fig posts here if you’re after more specific info on fertilizing, pruning, strengthening a leaning trunk and common FLF myths. I was given a tall fiddle fig plant when the neighbours moved but it has most of the leaves on one side as I don’t think it was turned. Should I try notching to make it more even? Thanks for your post! It’s full of really helpful info. I’ve had my fiddle leave fig for about a year now and I love it dearly but it’s started to grow a bit strangely and I’m just wondering if you have any suggestions. First of all, it had a big spur of growth a while ago and now has a cluster of leaves at the top but the stem has barely grown so the stem that is there is like an S shape with so many leaves coming out of the same area. Is there anyway I can stop it doing this and coax it to grow taller? Secondly, I have one leaf that all of a sudden became much bigger than all the rest (like at least two times bigger) and its curved, almost concave in shape. It looks really strange compared to the rest of the leaves and it seems to be weighing down the plant. Why has it done this? Is it light related? And can I trim it off or is there someway to train it to grow straight and upwards rather than curved downwards? When the leaves are growing close together, that’s actually a good sign! It means your FLF is receiving enough light. When there’s gaps between the leaves on the stem, it’s a sign they are searching for light. As you’ve had a spurt of growth, it may take a little while for the stem to adjust to the new added weight of the leaves. If it is bending towards a window, make sure you rotate the pot so each side of your FLF can receive light. This may help it to straighten up. Another thing you can do to straighten the stem (which I’m posting on in more detail next week!) is to give it some time outside where the breeze can help strengthen it. I bought a new FLF where one stem was weak and bending with the weight of new leaves. After being outside for 1-2 weeks, it learned to straighten up and was much stronger. When we keep them indoors, they don’t have the opportunity to strengthen their stems as they never need to withstand a breeze. If the larger leaf is kind of dimpled, it could be a sign of low humidity as it developed. There may not be much you can do now to change the shape. FLFs naturally produce larger and larger leaves as they grow, so I’m not surprised yours has done this (mine did too)! I would also say that putting your plant outside for a while to strengthen the stem can also help it to support this extra large leaf. Other than that, I would just make sure your FLF is getting enough light as sometimes the leaves will turn towards light. As it continues to grow, I’m sure the giant leaf will become less noticeable. If it really bothers you, you could trim it off but I always prefer to leave all leaves on as they help provide the plant with nutrients. I have a few questions, but first, I better give you some background info so that you have the bigger picture. I live in Ohio (almost as cloudy as Seattle) and I bought two shrub type Ficus Lyrata from IKEA last summer (around July 2018). Since then, it dropped a lot of leaves so I panicked but soon learned that they were adjusting to the new environment. Anyways, starting end of February (this year), I noticed new leaves and I’ve been fertilizing them with Fiddle Leaf Fig Plant Food (about 2tsp diluted in 4cup water every 2 weeks). It’s put out quite a lot of leaves. Both plants are about 2ft tall from top of the soil to the top of the plant and about 1.5-2ft wide. I’d say these are still pretty small. My goal is to have them looking like a tree (branches and all) with about 5-7 ft tall eventually. Now here are my questions. 1. Each plant is still in a cluster (around 5-6 stalks in one pot). Should I separate these into single tree? You mentioned to do this early growing season, which I assume that’s end of Feb-March. I don’t want the repotting to shock these plants and make them drop leaves. But I’ve noticed the edges where it bumps against another leaf turns brown and that portion of the leaf just dries up and doesn’t look nice. So I’d like to separate them if it’s not too late and won’t cause much damage. 2. How often should I fertilize them? I’ve seen every watering to once a month. 3. I see red specks in new leaves. I’ve read that these are indication of edema (too much watering). But I only water when the top soil (2 knuckles deep) is dry (when pinched, there’s no water/moisture). When the leaves grow bigger, the red dots disappear. Sometimes, the new leaves look great and don’t have red dots. Is it due to irregular watering? 1. If your FLFs are several planted in the one pot, you can definitely separate them. Have a look around the base to see if it looks like they connect just below the surface or have their own root ball. You’ll have better success separating them if they have their own root ball, however you can still separate them if they share roots. Doing this is a little bit more tricky and risky and it may take a little while for them to recover. In this case, you would need to use some sharp cutters to cut through the roots to give each plant a root ball in proportion to the plant’s size. You may also want to put the roots in a bucket of water to help remove as much dirt as possible and to help detangle. Make sure the roots don’t dry out when repotting! Its best to do this when your FLFs would have the most energy stored, around May or heading towards the longest day of the year. This will ensure they have the best possible chance of responding well to the change. If this seems like too much, you may be better off getting a new FLF that has a single stem. That way you can prune it when it reaches the height you’d like it to branch at, and train it into a tree from there. 2. FLFs are light feeders and it would be fine to fertilize them once a month. Some people prefer to dilute the fertilizer and feed it in a weekly watering, which is also fine. I would go off the product’s instructions. Some fertilizers are more concentrated then others, so there’s not really a ‘one size fits all’ rule. 3. That sounds like edema! As long as its not too severe, it isn’t a major problem. Like you said, the dots generally lessen or disappear once the leaf matures. If you are watering only when the top two inches of soil is dry, its possible the edema is caused by the soil retaining too much water. FLFs like a well-draining mix, which you could look into changing if you plan on repotting. Also make sure you are fully saturating the pot until water runs out the bottom each time you water. Emily, thank you so much for your thorough reply!! This helps A TON. I am up for the challenge so I will repot in May since that’s when I have more free time anyway. Thanks again! Hello – thanks for the details, this was super helpful! I have a FLF that I found at Home Depot (I was stoked) but it’s not grown at all since I brought her home (I did repot her upon integrating her into my house). She’s mostly vertical (leaves are tight to the stem). She sits in a bright window but it’s winter. Water levels seem ok – should I try to prune the top to encourage growth? Will she just wake up at some point? I think this winter is getting the best of my fiddle fig, admittedly I have negelected her a bit over the last 2 months. She sprouted 3 new leaves in December but even while sprouting new leaves most of her other leaves were dark green and starting to curl under. Then this week she dropped 30 leaves! Would giving fertilizer to give her a boost? And is there a certain time of year that is better for that, or could I do it anytime? Or do you have any other suggestions. Hey Amanda, you can give fertilizer any time of the year, normally just using less in winter (or less often). However I would say your FLF has probably dropped leaves more due to environmental issues! These could include not getting enough light, or extreme cold temperatures, or dry air. Check these things, which can change during winter. Also check the soil a couple inches into the pot to see if it is mostly dry before watering. Hopefully now that winter is coming to an end, your FLF will start to recover! Hi Emily, just wanted to thank you for all the incredible information on this site! You’re the best! I do have a questions though. The new leaves on my FLF are developing lots of red/purple spots and just wondering what is causing this? I just recurved a FLF as a generous gift. It has leaves growing off the trunk pretty much from the soil. It’s about 6 ft tall. Should I trim off most of the lower leaves? It’s extremely full on the bottom and I feel like they usually have a bare branch woth leaves only towards the top. Thanks! Hi Ashley, what a nice gift! You definitely don’t have to trim the leaves, some people prefer the lush & bushy style FLF. Sometimes the lower leaves will drop off as the plant matures. The tree-styles you see have mostly been pruned that way for their look. The leaves also help to provide energy for the plant so if you remove too many at once, it may not be beneficial for the plant. You could remove some of the leaves if you prefer the tree-look, but don’t do too many at once or the plant may go into shock. Please help! My beautiful 6+foot FLF that I’ve had for over two years has succumb to freezing temperatures last night when our heater failed in the all season room. The leaves look aweful drooping and are very dark green/brown. Can I revive it ? I bought a plant lightbulb and put it on. I watered it with FLF fertilizers. Now I sit and wait ? Hey Anna, I think I answered you on the other page but yes, after doing those things, wait to see if it livens up again! FLFs are tropical plants and are very sensitive to cold. Even if all the leaves drop, keep caring for it as it is possible that it will push out new buds and leaves as Spring arrives. Thank you so much for your reply. I’m assuming that the leaves will eventually just fall off? I’ll keep you posted. I just bought a large fiddle fig tree and it needs to be potted. Should I wait awhile to pot it so it can adjust to my house first? If so, for how long? Also, how do I know what size pot to get? Thank you! I received a FLF as a present which was gorgeous. Shortly after getting it, we got a bigger pot and did our normal manitenance. After about a month of having the FLF it started to develop brown spots which grew in size, eventually dropping to the ground. I bought a water meter and was keeping it in line avoiding to over water the tree. I deemed the tree dead a month ago as all that is remaining on the 6’ tree is a couple of leaves on 4 branches coming off of the Main stem. Two weeks ago it started sprouting new leave and branches up and down on the main stem. Have I killed it and miraculously brought it back to life? What is going on with the top portion? I have the tree in a drainable pot and never have water come out of it. Hi Justin. FLFs can sprout new growth when this happens, similar to pruning – when the tree thinks there’s no growth left on top, it automatically grows more in its place. This means your FLF is hanging in there, so that’s good! The leaf drop could be due to a few different things, normally over or under-watering. Only you could tell which one it could be, but make sure when you water to saturate the roots fully until water comes out the bottom. If it doesn’t drain well when you do this, the soil may need to be changed to a chunkier, well-draining mix. Moisture meters can sometimes be unreliable, but if you stick your finger in the dirt a couple inches, you’ll be able to feel if the soil is still damp or not. If you hadn’t watered in the last month when you thought it was dead, then it started pushing out new growth, I would suspect it was being overwatered! FLFs like a lot of water, but less often. When the leaves develop browning on the edges first, this is normally due to dryness. If some of the branches remain bare, try pruning them back a little to encourage growth again on these areas. You may also want to get a quality 9-3-6 fertilizer to give it nutrients especially while it is putting out all this new growth. HI Emily! I really enjoyed your post and tips for growing this wonderful plant. I was curious, what do you suggest for a fiddle leaf that has multiple trunks that are all attached? I’ve read on separating trunks that are detached but not so much on if they are all coming out from one trunk. My fiddle leaf is almost 5 ft now (after growing for 1 year) so I’d say it’s a very young teenager but I’m not sure what I can do to encourage growth on just one trunk. Do you have any suggestions? Should I just wait till it starts getting more mature or should I start cutting those other trunks and just leave the main one? Hi Ashley! Thanks for your comment, so glad the post is helpful 🙂 When you say they are all attached, are they branching out at a point from the main trunk or growing out of the soil? If there’s multiple trunks in the soil, you can try to separate them when repotting, however for a FLF that is already 5ft, the roots may be too interwoven to do this without too much damage. If there’s lower branches coming off the main trunk, they can be pruned. You would need to identify the leading branch (healthiest / largest) that you would like to be the main trunk and prune the others. However if your FLF is already naturally growing with multiple branches and its already 5ft, I would wonder if its best to let it continue growing this way? If you try to prune too much off it, it may go into shock or not recover. Hi! My FLF is going on 3 years old and is doing quite well growth wise. Mine is the columnar type of plant. My question is this; the lower leaves, although healthy, are pushed to point downward by the larger leaves above them, which seem to simply weigh them down. I hate to prune healthy leaves off my plant but I am unhappy with the way this makes the plant look. Should I remove them? Thank you. Thank you for posting such an informative post! I have 2 fiddles and would love a little advice 😁 Around 6 months ago I purchased one that is more of a bush (around 1.5 metres) and has big, full and mature leaves. What can I do to encourage more growth at the top so it grows more tree like. In the last few months this guy has also been growing some kind of mushroom/fungi in the soil. Should I repot him or remove the funghi? My other fiddle is around 1 metre tall and more tree like. There are two shoots. The tallest shoot has been growing ferociously over spring/summer with large leaves at the top. This has left it with small leaves at the bottom and a thin stem, causing him to bend over. Should I use a stalk? What can I do to encourage bigger leaves at the bottom? I’m glad this post could be helpful Mel! For more tree-like growth, I’m guessing you mean branching. To encourage branching at the top, try pruning the tip. I did this and got 2-3 new branches out of it. You can also try notching for branching in specific spots too. For the fungi, I would check that you’re not overwatering the plant and make sure it gets enough sunlight – if the soil is drying out at the top between watering, you shouldn’t have any mushroom issues. You may need to repot if you find the soil is retaining too much water. Use a well draining mix. The best time to repot is late spring. Your second FLF sounds similar to mine – FLFs naturally produce bigger leaves as they grow. Staking can help it from leaning in the short term if its an issue. You can also try wiggling the stem to strengthen it (I now put my FLF outside and the breeze has helped strengthen the trunk). If the leaves are far apart on the stem, your FLF needs more sunlight. When the leaves grow closer together they provide more support for the stem. A quality fertilizer can also help to thicken the trunk (check out my FLF fertilizer post for more info). Hope these tips help! I have notched my plant but it does not grow new branches. What am I doing wrong. -Make sure the notch is directly above a leaf node. This will activate the particular node to grow. -Make sure the notch is cut one third deep of the diameter of the trunk, and takes out a section of about 2mm of trunk. It is basically cutting a section out of the trunk to stop the growth hormone flowing, tricking the plant into putting its energy into growing a new branch. -Make sure your FLF is already getting the proper light, watering and nutrient needs. Your FLF will need to have enough energy stored to grow a new branch. -Lastly, make sure it is the growing season! If you’re based in Australia / southern hemisphere, now is a great time to notch. However if you are in North America, I would wait til around June when your FLF should be at its peak energy reserves. Hope these tips help. Let me know if you have any more questions? Hey Julie, it sounds like your FLF may be lacking the energy resources to grow to full size. This can happen for a bunch of reasons, depending on your circumstances. Make sure it is getting the correct water & sunlight needs, then check if it is root bound. If all these things seem ok, it may be lacking nutrients in the soil. When I started fertilizing my FLF, the new leaves doubled in size! Check out the fertilizer I’ve linked in this post (affordable & VERY effective), or look for a fertilizer that has a NPK ratio of 9-3-6. This ratio is most effective for FLFs and can be found on the label. All the best! I would love to hear how you go. May I please ask what the best thing to do is? My fiddle Leaf fig is now about 12 feet tall!!! Am I able to halve the height & would I be able to replant what I’ve cut off? I absolutely love it, but it’s out growing my house!! ? Hey Leigh, you could totally prune your FLF to the height that suits you! For best results I would wait until mid-late Spring, when it will have more energy to handle the change. Make sure you cut on an angle and when you replant the cutting, stick the bottom 3-4 inches into the soil (remove any lower leaves if you need to). If its a large cutting, you could even cut it again to propagate from two pieces! All the best! I just bought a FLF bush and it is in a temporary pot and needs replanting. It’s November in the San Francisco Bay Area and it is still warm – days are in the 70s but nights are in the mid 40s. Of course it is an indoor plant and I don’t let my house get cooler than 65. Everything I have read says to wait until the growing season in spring for this plant to replant. Will it be okay in the temporary black pot until spring or should I repot? Hey Julia, your FLF should be fine to wait to spring to repot! As it cools down it would have slowed or stopped growing, so being root bound won’t get any worse until you get the chance to repot anyway. Waiting until spring will give it the best chance for recovery and new growth! ? I want to repot before my fiddle slows down for the winter, I have Hyponex plant soil with fertilizer, the other potting soils I have bought formed worms and ate my plants, so my question is can I repost? and it’s growing into a tree so how can I make it a bush is which I prefer? I have a 1 very tall fiddle leaf fig stem (1.5meters) with sparse leaves and with 2 much smaller stems (30cm) which appear to be coming from the same root ball. I am wanting to notch the larger one to encourage branching. How many notches can I do at once and should I give it a dose of seaweed tonic (seasol) at time of notching to help with stress??. Should I also remove low small branches so more energy is put into the new growth from the notches?? Hi! I just found your blog, so so helpful! I have a single stem FLF which has a sparse patch where the leaves browned/dropped after being sunburnt. So the bottom leaves are fine, then a gap, then top leaves. Should I try notching in the gap to see if itll branch out there and fill out? Or am I better off cutting there and propagating a new plant? Also I’m confused about pinching; does that stop the plant growing taller or just divert energy towards growing branches and then itll continue to grow from the top? Thanks!! Hey Nadine, so glad the blog has been helpful 🙂 You could really do either option, depending on how thick your FLF trunk is. Notching works best on trunks that are more mature or have turned ‘woody’ brown. If your trunk is still quite thin you could either prune it and propagate the cutting, or wait until your FLF matures before trying notching. Keep in mind what shape you’d like your FLF to have in the future, as the height that you prune it is where it will branch. Think about if you’d like it to be lush and bushy, or a single tall stem with a ‘lollipop’ style tree top, or something different. This will help you determine the best path to take. Pinching is similar to pruning, but instead of pruning off a section of the stem, you just take off the top growing tip. Whether you prune or pinch, your FLF should send out new growth from dormant buds where leaves meet the stem. Both these methods encourage branching and while the pruned/pinched stem won’t continue to grow, your FLF will still grow taller via other branches. This is why it’s a good idea to wait until your FLF is at the height you’d like it to start branching from, before pruning. All the best! I picked it up at my FLF at local my local grocery store for $7.99! I was so excited when I found it! I have wanted one but didn’t want to spend $100 on a decent size maturing tree… just to kill it from my lack of FLF care. So I have had the three young trees in the same 10″ pot since I bought it over 2 months ago. They have lost some of its lower leaves on each of the three trees. Two of the 3 trees have new growth budding at the top. So I must be doing something right. My questions are should I fertilize now? Also should I wait till spring to separate the three trees into their own new pot till early spring next year? Thanks! Hi Brittney – you could fertilize it once or twice now before the weather cools down too much, but I mostly only fertilize mine during Spring/Summer, when it will be needing the extra boost to grow. And yes, I’d wait til mid Spring to repot them, this will give them the best chance to react well to the change and grow again. Make sure you remove as much of the old soil as you can and give it a fresh new batch of soil so it can benefit from the new nutrients. All the best! Thanks for your comment Anna 🙂 Glad that these posts were helpful for you! Hi Emily! I’m new to the FLF family! My husband bought me one back in the spring…so far, so good! I haven’t transplanted it to a new pot because I’m not quite sure what type of pot to get. I see most people put their FLF in baskets and I even found a basket I love. I obviously don’t want a pot with a hole at the bottom because the basket would get wet. But if it doesn’t have a hole, how does the water drain so the FLF doesn’t get over watered? Help! Also, what type of soil should I use to help fill the pot? Thanks so much! Hey Laurie, that’s so exciting you have a new FLF 🙂 I think the first thing to ask is if it needs to be re-potted? Can you see roots at the bottom hole or does the plant look too big in proportion to the size of the pot? Baskets are a great way to hide a plastic nursery pot or other cheap pot, if you’re repotting based on just the look of the pot it’s in now. However if it needs repotting, I would definitely recommend getting a pot with holes in the bottom as your FLF needs to be able to drain. If you don’t want to wet the basket, there’s ways around this. Either take the plant out of the basket when you water, or add in a pot plant dish / tray that the water can drain into. If the water can’t drain out, it will jeopardise your FLF’s health! When you decide to repot, get a good quality soil mix or ask for a mix that allows for good drainage. It can get more in-depth when it comes to soil, but that’s a simple and effective place to start. Hope that helps! Let me know how you get on and if you have any more questions ? Hi love this page!! My fiddle leaf fig has 3 very thin stems growing at the base of the plant are those viable or should I just cut them off. Emily, thank you for the good advice! I wonder how you continue to have a nice thick “tree” form once it is about the size you want? Can you prune off the uppermost leaves to keep the growth modest and the tree thick rather than with long spaces between leaves? Thank you Jane! If your FLF has reached a size that you don’t want to continue to grow it past, you can keep pruning it back to size. Another benefit of doing this is that it may back-bud and get more lush growth on the remaining branches. Generally if there are long spaces between leaves, it means the FLF isn’t getting enough light. To encourage bushier growth where the leaves grow closer together, see if you can move it to a place with more sunlight. I’m glad this post was helpful for you! I’m looking for tips on how to thicken the trunk, and encourage new leaf growth at the bottom of my “bush/column” type FLF. At the moment it’s healthy, but the leaves are small, sparse, and the trunk is quite thin. What do you suggest? Hi Maddie, FLFs trunks are naturally quite thin but should strengthen and thicken as the plant grows. Don’t remove any lower leaves, as they provide energy for the trunk to thicken. If the leaves are far apart, your FLF may need more sunlight! Try to move it to a place where it can get more light, which should help the leaves grow closer together and also keep the trunk strong. Hope that helps! I accidentally notched too deep and now the branch is really dropping. Is this bad? Should I just cut it off? Also, I did a couple other notches on other branches at the same time. I hope this is ok! Hi Jamie, your FLF should be fine to have multiple notches at once, although it may not respond to all of them if it doesn’t have the energy reserved. It’s best to notch when you know your plant will have reserves – around the time of summer solstice where the hours of light are the longest. If the end of the branch you notched that’s dropping is still alive, the branch may have just lost some support from the deep notch. You could try making a splint for the branch to keep it straight – if you don’t want to lose it and it’s still alive, or you could just cut it. If you cut it you can always propagate a new FLF from this part, so there’s nothing lost! If the FLF has gotten too tall for the available space, can the trunk be cut off I.e. topped? If it can be cut, is it possible to root the cut portion to make another tree? Hi Bill, yes and yes! You can cut the trunk off where it is getting too tall and your FLF will send out a new shoot and keep growing. it’s great that you don’t have to waste the part you cut off as well, by propagating the cutting! Make sure when you prune it, you use something sharp to get a clean cut, and you might like to pick up some rooting powder to help with propagating the cutting. My FLF, Sven, has grown a few feet! One trunk, very happy, but he’s near the ceiling. I’m sure I need to prune or ?, but I’m anxious about it. Help! There’s no need to be nervous about pruning! :) Its a totally natural part of plant ownership. Just make sure whatever you use to prune has sharp blades to give a clean cut, and as long as you’re not cutting the majority of the plant back, Sven will be fine. If you live in the northern hemisphere, now is the perfect time to prune too! The warm weather gives the plant enough energy to push through changes like pruning and keep growing. All the best! I recently bought a Ficus Lyrata. It had a new leaf bud, but it has dried up and turned brown (worrying about over watering, I didn’t water enough!) Should I pinch the leaf bud off? Thanks. Serife. Hey Serife, there’s no harm in pinching off the leaf bud if it looks like it isn’t growing anymore or has died. Your FLF should simply grow a new lead leaf bud and keep going! All the best! Hi Linda, as long as the 2-3ft you want to cut off is no more than around a third of the leaves on the FLF, it should be fine! Plants need their leaves to produce energy, so if you remove too many it can go into shock. Make sure your FLF will still have the majority of its leaves left after pruning! You can always use cuttings to propagate, and if you would like multiple cuttings, you can even trim the section that you cut off into several parts. I received a Fiddle Leaf Fig in poor condition from a friend of mine, as I was willing to try to save it. I have 2 other successful FLF’s at home already. The one in poor condition is entirely bare except for a couple of leaves at the end of each branch. In the last month or so, it has grown a couple more new leaves at the end of the branches. I saw the tree when she first bought it, and it was beautifully shaped. It now looks so awkward with nothing on the branches except the tips. I’ve been considering cutting down the branches and seeing what it will do (but then there would be essentially no leaves). I just don’t want it to forever have these long bare branches and it doesn’t seem like a FLF will ever pop out a new leaf mid-branch (just at the ends). Would this work? Or should I try to notch it? Hi Lauren, you could definitely try notching or cutting it back, but if it were my own FLF, I would probably go with cutting it back. Notching may work to get a new branch, but most likely won’t get you the desired lush and bushy look if all the other branches are mostly bare. Make sure it has the best conditions possible first eg light, air flow and a good fertilize. If you cut each branch back closer to the main trunk, hopefully new branches will grow from these pruned ones. It is a bit of a bonsai trick to do, to cut everything back with no leaves left, but give it time and it should recover with the right conditions! Spring going into Summer is the best time to do this. All the best! Would love to hear the progress. I really like the look of fiddle leaf figs. I would love to get one for my living room. It’s good to know that spring and summer will allow it to grow the most. I’m sure there could be some overgrowth that would require some trimming as well. Hi Noah, yes you can prune the top, this is actually good for your FLF. You can also use what you cut off to replant, this is called propagating. Make sure you use something sharp to prune your FLF, and you can either place the cuttings in water or straight into soil. If you go straight to soil, try using cutting powder (can be found at nurseries) which helps new roots to grow. All the best! Thank You for all the information on the Fiddler Fig Ficus plant. I’m waiting for the Wal Mart or Lowe’s to get that plant in here in Southern Illinois. I prefer the bush to the tree but I’m seeing more info about the tree. I would appreciate all the information on the name of the bush so I’ll know what to purchase and not get a tree plant and any other information you can give me on the Fiddler Bush. Hi Cathy, thanks for your comment. There’s actually just one type of Fiddle Leaf Fig – so you you don’t have to worry about finding the right type! The tree style vs bush style just depends on how you prefer to grow and prune it. Some people remove the lower leaves to get it looking more tree-like. If you prefer it to be more bushy, you can just prune back any branches or parts that are making it look too leggy. Keep in mind that as your FLF grows (they can get quite large), it may tend to appear more like a tree. What you could do is to keep an eye out for one that has multiple trunks in the pot (called a cluster), which will help with the ‘bush’ effect. Hope this helps with your search! Happy growing. I have a Flf that is only one trunk. I am interested in having it branch out and grow into a tree. At what point should I cut off a leaf, or notch. It is about 18″ tall at this point. My ficus is 12 feet tall and starting to bend at the top. The are plenty of lower branches and leaves. Can I trim the top off and plant it in another pot? It’s so lush and I’m afraid I’ll kill it. If I can trim it how do I get it to root at the bottom? I’d appreciate any help and info. Hey Mari, you certainly can trim the top and repot it! This is called propagating and is often done with plant cuttings. I’ve heard its best to propagate with a piece that has a few leaves on it. If you are wanting to trim more than just a few leaves off the top of your plant, you can always cut into smaller sections the piece that you do trim off, and have multiple new plants. There are two ways you can propagate – by planting the cutting straight into soil, or by placing the cutting in water for a few weeks or so, until roots start to grow. It is up to you which way you decide (and if you get multiple cuttings, you could try both ways!). If you do water propagation, be careful with the roots when you transfer the cutting into soil, as roots that are grown in water are often more delicate. If you decide to place it in soil straight away, get some cutting powder from your nursery. This helps to encourage root growth. As long as you’re only pruning 1/3 or less of your FLF, it should respond fine! Pruning is good for plants and even encourages more growth. Have fun experimenting and let me know if you need more help! Hi! Thanks for this article! I’d like to notch to encourage branching in two places. Should I do one notch at a time? Would two be too traumatic to the plant? Thanks for your advice! My fig is getting way too tall and is bending badly. Can I just cut the trunk back to where I want it? Will it branch out if I do? My fiddle fig tree is totally dying, it has brown spots, some leafed are turning totally brown and falling and as soon as that happens the next leafs go through the same process, what should I do to save it. Should I just cut the leafes? Help please!!!!! Hi Janette, is your FLF getting too much sun? While it is tricky to figure out the exact cause of your FLF leaves turning brown and dropping, I would start by changing things one at a time. If you think it could be getting too much sun, move it to a shadier spot. If you don’t think this is the cause, is it not getting enough water? The last thing I would check is to look up close and see if you can see any eggs or bugs on the leaves that could be causing the plant to die. Changing things will help you figure out the cause to then fix it! Hope that helps. I recently (4 days ago), purchased a fiddle leaf fig plant—the bushy kind—in only 4 days of having it in my living room, in an apartment building, my tree smells awful and I have developed breathing problems, itchy eyes, and a stuffed nose. I understand that the ficus lyrata (which this plant is), may produce mould spores and thus cause these allergies. Should I get rid of my tree? Or possibly put gravel on the top so I don’t smell the soil. When I enter my apartment, after several hours, there is a bottom of the garbage pail smell throughout the house. Yes. My tree smells awful. It may have had a smelly fertiliser applied, if you have an outdoor space, you could put your FLF outside until it improves. Sometimes the fertiliser is present on the leaves, so try wiping them down with a damp cloth too. You mentioned putting gravel on the dirt- if the smell is coming from the soil, try giving it a big water next time you water it, to flush anything out of the soil. Water it until the water comes out the bottom of the pot. Thank you very much for all of the good information that you have provided about Fiddle Figs. I recently inherited my son’s fiddle fig when he moved to Germany. I hadn’t realized that there were two types of fiddle figs… his had the leaves growing from the bottom to the top of the plant (bush). I saw a picture of a fiddle fig on line that looked like a tree so I decided to get rid of the leaves on the bottom part of the plant to reveal the trunk. On reading your blog I discovered that I shouldn’t have done this! Oops! I hope that my fiddle fig will be able to overcome my mistake. The roots of the plant are highly visible at the top of the pot… is this normal? Should I cover them with dirt? I realize that I will either need to trim the roots a bit or re-pot it. Would you please advise me? Is there a special soil recommended for my fiddle fig? Thank you so very much in advance for your advice! I purchased a FLF late last summer. I had it near a window but it only received morning direct sunlight. After a few months nearly all but maybe 3 leaves have fallen off the top of the tree but I have substantial growth at the base. I was watering it once a week but I don’t think I was using enough water. Will the top leaves ever grow back in especially with spring right around the corner or should I consider the notching? Thanks! I have a fabulous FLF that was given to me like a year and 1/2 ago. It has grown to at least 10 ft but in doing so has become somewhat “one sided” and a little leggy in my opinion. During the summer I pruned a small amount, learning later this was not the time to prune. I did see new growth after that pruning but still have no signs of new branches. Did I screw up pruning during the growing season? I am looking for some advice to keep my FLF alive! I’m hoping you might be able to help! I bought the tree at the beginning of the summer and it was doing beautifully for several months. I water once a week, and let it dry out before watering again. I also had it in a great spot, but during the winter that spot turned out to be very drafty so I moved it. The spot it was in seemed very similar, and was doing well. Now it has started to drop leaves, and the leaves are turning brown and crunch at the ends. Any advice??? Thank you! Thanks for your article! I have a FLF that is about 12 feet tall & is leaning hard at the top. I’ve been debating taking off the top & rooting that, hopefully encouraging branching at the top (it has 2 branches lower down). I will follow your advice and wait until spring. Any further tips are welcome! I think I killed my fiddle leaf tree! He was getting brown leaves so I moved him to the office to more indirect light. Then I found little worms in the pot so I took him out, got him new dirt and rinsed his roots. I replanted him and he seemed to be fine, but I went on vacation and he was forgotten. I came back to his last four leaves broken off from dropping. He didn’t get watered while I was gone. Now I just have three branches with no leaves. It’s the middle of December and from what I read I might not see any new growth until spring. Is this true? Do I have any chance of bringing him back? Hi Jenna, it sounds like your FLF has no leaves? If this is the case, unfortunately I don’t think there’s much chance of revival. You could wait and see if anything happens in Spring, but if the branches are brittle and can be snapped off, this is a sign that its died 🙁 It might be time to take a trip to the nursery for a new one! If I have removed leaves from the trunk, do they ever grow back? Hi Bender, Unfortunately they won’t grow back. The only possible solution is to prune or notch the trunk to encourage your FLF to back-bud, which means dormant buds could grow into branches off the trunk. This will help it look fuller, but where the leaves themselves were removed, will stay bare. I bought a really nice, full, bush style FLF this last spring. I had it growing in the shade on my patio in Dallas, TX. We had an early cold snap – didn’t freeze, but was windy and temp dropped to 38. The FLF has been brought indoors, but has dropped all the lower leaves – probably lost 25-30 leaves. The only ones still intact are on the very top – probably 12 leaves remaining. Is it a total loss or can I cut it back? Hi Kathy, as it sounds like your FLF has lost the majority of its leaves, I wouldn’t prune it back, especially during the cooler months. It would have lost its ability to produce energy when it lost the leaves, and therefore the ones still there will have to work extra hard! Pruning any back may harm your FLF. When the warmer months hit and you notice it growing again, you could try pruning it just a little bit to encourage buds to grow on the lower area. Hi, the new leaf coming in on my fig leaf tree has some brown around the leaf. When it fully comes in, can I trim the brown off of the leaf without hurting it? My tree is losing leaves so fast. Two or three a day. Any suggest ?? The veins turn brown and tips are crispy. I have it near a window and water only when soil is dry. It’s a single stem and most the leaves have fallen except for the few on the top. They continue to show new growth but recently the leave I do have left are droopy. Please help ! I have a very happy 3-trunked FLF which was probably 4 ft tall when I brought it home 2 years ago. I did have to stake it to keep the trunks straighter for foot traffic reasons. It has grown to approx 8 feet tall, which is amazing! So far it’s still standing tall – but with much more growth, it may start to topple! And I don’t necessarily want it any taller. You mention trimming leaves off the top. Could you please give me a bit more informaton? Hi Myrna, you can simply cut off the top of your FLF at the height that suits you to prune it down. Make sure you have a sharp pair of secateurs to prevent any unnecessary damage. As long as there’s still a decent amount of leaves left on your FLF it shouldn’t be a problem! Keep in mind its best to prune in Spring/Summer, and growth should slow in Autumn/Winter, so it you can leave it as it is (it won’t grow much during the cooler seasons) until its Spring/Summer, that would be ideal. Hope that helps. Hi Emily. I have a FLF that has grown over 2 feet in 1 year. Its active growth recently slowed (over the spring and summer, which surprised me), and it dropped nearly 10 leaves on the lower trunk. I thought it was dying but it’s since stopped, so I assume it was transitioning from a bush to a tree. Does growth typically slow when a FLF is transitioning from bush to tree? Also, I added more soil to its pot this spring but it looks low – would adding more soil (even to the bottom of the pot) encourage growth? It has a very curvy, thin trunk, with three long branches – the longest being the main trunk. I’m hoping new branches will help fill out and balance the tree. How do I encourage new branch growth (rather than continuous growth on the 3 existing branches)? Should I notch the trunk in order to encourage new branches, or prune? Which is more effective, and less likely to cause damage? If I notch the main trunk, will it kill the leaves above the notch? If I prune the main trunk, will new growth happen where it was pruned, or elsewhere? Also, it’s October – should I wait until the spring to do this? Lastly, if I stake the tree to support the trunk upright, do I need to be careful in how I stick the stake into the soil? Can it damage the root system? Thank you so much for your advice. Hi Elyse, I’ll try to answer a few of your questions… There’s a number of reasons why growth may have slowed/leaves lost, and its a little bit of trial and error, but its possible that the pot/soil its in is no longer providing it with enough nutrients – especially if your FLF has grown a lot. You may need to repot it with new soil (remove all the old soil from the roots) or try a fertiliser. Notching is more effective than pruning to encourage branching. Both of these are not designed to damage the plant, in fact they are healthy parts of a growing plant. With notching you can almost ‘choose’ the area you’d like a new branch to grow from. With all plants its best to wait for a growth season to apply any changes (you could still fertilise to keep it healthy though). You could also stake it until you’re ready to try pruning/notching/repotting… If your FLF doesn’t seem healthy (dropping leaves etc) its best to focus on getting it back to health first. For example if its not getting the nutrients it needs from soil or fertiliser and not growing in general, it won’t have the energy stored to create new branches anyway. Hope that helps you! We need help. Can we send you a ours is a tree and leaves are dying however is new growth at the very top. I can send photos via email. Do you have to separate a cluster? I purchased a mid size cluster (3 total) and repotted the cluster all together. Is this okay or should I repot them in separate pots? I replanted my FLF, it has grown a lot and is hitting the top of my ceiling? Where can I trim it so it won’t die? I just bought a 3ft. tall FLF this weekend. In proper conditions how fast can I expect the tree to grow in terms of height? Hi William, FLFs are generally slow growing and do most of their growing in the spring/summer seasons. Mine has grown about 2 foot in the past year, so if you’d like it to grow fast, the best things to do is provide the best living conditions for it- light, soil and water. Be patient and enjoy! ? Hi Barb, FLFs respond well to a bit of pruning, however it is best to make sure the majority of leaves are left on the tree after pruning, ie make sure you don’t take too many leaves off! Without the leaves the FLF will not be able to produce energy. Keep this in mind if your FLF is already missing leaves from the bottom! All the best. Thank you Emily. I had given thought to putting it in water to sprout first. Hope it works! ? I have x3 FLF slender trunks that have been twirled (you can tell I am a novice gardener) together to form a stronger trunk. It is super happy and I’ve had it for a year. It is now starting to splay as I’ve not tied the trunks to twist around each other, plus a branch has sprouted. There are now four very happy branches which currently feel pretty sturdy. I would like to re-pot it as the roots are busting out from the original planter but also need to manage it’s size. It’s about 4.5 foot high from the soil base so has lots of potential to grow. Another couple of feet up is fine but it is the width that I’m a little concerned about. I have a new larger pot at the ready – should I wait til Spring (UK) which seems so long away or go for it now with a good few months of sun left ? I’d welcome your thoughts on the above plus any re-potting tips. Hi Philippa, sounds like a healthy FLF! I think it would be ok to repot now, keeping in mind that a bigger pot will allow the tree to grow bigger altogether. You can always trim the branches or stake them up a bit straighter if they are too wide. Make sure the roots don’t dry out when you repot by working quickly and watering in its new pot straight away. Soil choice is one of the most important things so double check with your nursery if you are unsure on the type ? Hope that helps! What a great blog just when I needed it. I inherited a tall single stem FLF from my daughter and since being here indoors the last 7months has grown taller, now at least 5ft. I came across your blog because when spring comes in Australia I want to chop the top off, perhaps by at least a third. I was reading that I can plant the top I cut off. Do I do this just into a new pot straight away? This is one of 3 FLF I have. The other two are multi head. Hey Elana, thanks for your comment! I’m also anxiously awaiting Spring in Aus to do a bit of work on my FLF 🙂 I think the best way to propogate the piece you cut from the tip would be to put it in water first, until some roots start growing. It would then be easier to plant in soil, knowing it has a better chance of surviving. Let me know how you go! Help…my 2 FLSs in one pot are reaching my ceiling. What should I do ??? Beautiful but beginning to bend as they reach less light above the upper part of my window. Thanks for your info. I have a tree FLF and the branches are long. I have tried to cut the tips hoping it will start a new branch from the trunk but it does not. How can I encourage more branching? Thank you. Hi Maureen! Try pruning the tip of the main trunk rather than the branches themselves. Pruning the branches will encourage the branch to back-bud, which means they’ll end up bushier. Otherwise you could try notching on the trunk above what looks like it could be a bud. Hope this helps! Hi! I’m thinking of pruning off the top 2 feet of my tree, can I just plant that cutting in the same pot for propagation? Hi Frederica, sometimes its best to keep a cutting in water until roots start to develop, and then plant. I would say to use a new pot so its not competing for the same nutrients or overcrowding the pot. Hope that helps! My fiancé surprised my with my dream fiddle leaf fig the other day. I’ve only had it for like 3 days, but I’m already wondering if I’m doing something wrong! Most of the leaves on it are pretty sturdy/firm.. but I noticed today that the very top three leaves (one of which is the smallest/newest leaf) are soft/flimsy. They are not drooping down.. they’re still sticking pretty straight up but I’m worried that this might be a sign of something I’m doing wrong? Have you experienced any of this?? Any tips?? I bought a FLF (2 trunks in one pot, approx. 2′ tall) the other day and had no idea they were all the rage! I guess I’ve been living under a rock. Anyway, the ladies at the nursery suggested that I repot it so I did. Now I’m seeing pictures of all these fabulous single trunk/braided trunk with tons of branches and big full tops. I’m wondering if I should work toward that now or if I should just leave it alone for a while so it can get used to its new home. And if I should wait, does that mean waiting till next Spring? Will it be too late to separate them by then? I don’t want to shock the poor thing too fast. My impulse buy suddenly has me very anxious! Well, I’m less than two weeks in and my plant has brown spots on the bottom leaves. I’m pretty sure I overwatered it because I followed the advice of others to flush it completely. That was 10 days ago and the top soil still feels moist. ? ?‍♀️ Is there something I can do to accelerate its drying? Lighting may be an issue, but I’d rather not move it if I don’t have to. (It’s about 3′ from a south facing window.) If the brown spots spread once it’s dry, I guess I can try relocating. Thanks for your first answer, by the way. I’m not typically a commenter but your responses to others was so helpful. I’d happily take the advice of anyone else reading as well. I just purchased a nine foot FLF that is one stalk with leaves from the base to the top. It was wrapped when I purchased it, so I did not realize that there were no branches. (Maybe that is why it was only $20.00! I am unsure whether I should notch it and if I did, at what height I should do it. Or should I prune some of the top off to encourage branching, or possibly do both? Hey Carrie, $20 is still a great price for a 9ft FLF! I would give it a chance to settle in first to make sure its happy in the position you’ve put it, then you can try pruning, notching or both. Notching is probably a more specific way of encouraging your FLF to branch, as you notch directly above the leaf / section you’d like to see branch. Pruning may or may not encourage branching, but if it does branch, its a bit unknown where a branch will start growing. Hope that helps. I have a beautiful 10ft FLF in my living room that has a 10ft ceiling…clearly, I have a bit of pruning to do. I’m nervous to do anything to this gorgeous tree that my shock it or damage it but I have to trim the top. Do I just simply cut the top or is there a special method? Hi! I have two FLF and they are both quote skinny with one trunk. How do I make them busy and more leaves. They’re both about 3 feet and need some fattening up! I have a FLF that I bought that was in tree form, almost 6 ft tall. A few months ago it started sprouting growth at the base of the trunk and I let it grow. There are now three little branches that range from about 8″-18″ long with several leaves. I’m wondering if I should just let my FLF do it’s thing and let them grow or if I should trim them to keep it looking more like a tree. My trunk has always had a curve to it, so I’m wondering if these new branches would balance things out a bit. Would love your opinion! I just purchased a FLF bush last month. I have left it in it’s original container. There are a few leaves at the very bottom of the branch that have dark -brownish/black spots on the edge. Is it best to cut away, remove the leaf completely or repot ? How do you notch the tree? Xo you notch it where you want the new branch to grow. Does the notch site need any special card after? That’s a good question, I’d recommend looking up some forums for more specific details! Generally you notch the branch around 1/3 of the trunk deep, just above a leaf, around the height you’d like it to branch. You could also try pruning the top of the tree (just a few leaves) to see if that stimulates branching if you’re uncomfortable with trying notching first. Hope that helps! I have an 8 foot FLF that is looking healthy. It has a main trunk with 3 branches on top. One of the branches has taken off, growing like crazy. The other two branches don’t seem to be growing much. I’d like to keep it looking like a normal “ball” on top. Should I prune down the one branch to where it should be? Wouldn’t that encourage more growth and make the tree more lop sided? Hey Eric! That is a good question. To keep a more even ‘ball’ shape you’ll need to prune that longer branch back to where it should be – you can always use the pruned part to propagate a new FLF! Pruning the longer branch may actually encourage growth in other areas, especially if your FLF sees this branch as the main growing tip/trunk. Sometimes when a branch is pruned, the tree will redirect its energy into other parts of the tree… Pruning can ‘trick’ the plant into thinking that section is no longer growing. Hope it works out for you! I just bought a single bush from a store in Estonia. I can send you a picture. I read your writings and i just want to say thanks. I am going to go through the process of trying to turn it into a tree. Right now i am going to just let it acclimate to its new home. Hi! Thanks for all the great advise! I was planning on pruning my 7 foot single FLF bush this coming spring since it’s almost touching my ceiling. I was wondering what you meant by “pinching” the top? And when making notches on the side of the trunk to encourage branching in a specific area, how deep should I notch into the trunk? Thanks! Thank you for all of your great advice on FLF’s! I have a FLF tree whose branches and leaves have gotten so wide and heavy I am concerned it will start tipping over! Is there anyway to encourage the tree to grow upwards instead of becoming a top-heavy tree? It has one trunk. Thank you!! Hi, I had been looking a the fiddle leaf fig and I bought one for a friend hoping I would wait until spring so I could get me one cheeper , but the day before Christmas I luck up and went to a home depo and found one it was only 12 dollars so my husband got me 2 of them . They are about 1-2 foot and they are a bush. I want a tree also. Do I wait until they are about 3-4 foot tall and do I start taking leaves off the bottom first then pinch the top so they branch out. I know I have to do it slowly but I want a tree so bad. This is my first 2 plants. Thanks for the help. Hey Gwendolyn! Thanks for your comment. That sounds like a great deal on two FLF’s, as you might know the bigger they are, the more expensive they get (and quickly!) You definitely have the right idea, FLFs naturally start as a bush form and with a bit of training and pruning (and patience) you can shape them into a tree. I would only take off the bottom leaves once the trunk is nice and strong, or as the last step in your process. You can pinch the stop when it has reached the height you would like it to branch around. This is a good forum which goes into a bit more detail. My friend dropped a 6 ft. Fiddle Fig plant off she no longer wanted. Love it! But its to tall and is starting to lean. It has two stalks. Can I saparate them into two plants. And can I prune it to the height I want. Its in side now because I live in ohio. It has leaves down to the base of the trunk. Says not to remove these. So how do you getting looking like a tree?